Not just an intriguing headline, When Church and State Play God is the title of the latest book published by the Communication Foundation for Asia. 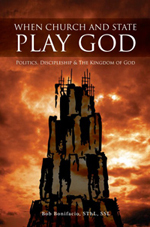 Subtitled “Politics, Discipleship and the Kingdom of God,” the book is written by Bob Bonifacio, SThL, SSL. Bonifacio, who used to be the head of CFA Publications in the mid-1970s, is now an adjunct faculty member of the Philosophy Department at the University of Guam. The cover of the book "When Church and State Play God" by Bob Bonifacio. Mr. Bob Bonifacio is also the author of Manubu and Ganu, previously published by CFA, and The Woman of Genesis, published by Claretian Publications. He obtained his licentiate in Sacred Theology from the Gregorian University and his licentiate in Sacred Scriptures from the Pontifical Bible Institute, both in Rome, Italy. When Church and State Play God is now available at the CFA Sales office and selected religious outlets.